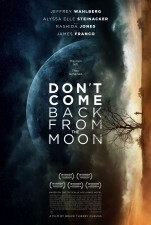 Don't Come Back from the Moon, 85 mins., debuted at the Los Angeles Film Festival June 2017, where it was reviewed by Sheri Linden in Hollywood Reporter, who heralded the director's "unaffected compassion for his characters." It has its theatrical release in New York and Los Angeles and in VOD Jan. 18, 2019. Watched for this review on an online screener Jan. 10, 2019. TRAILER.